[ Frances Power Cobbe, social reformer, anti-vivisectionist and women's suffrage campaigner. ] Autograph Letter Signed ('Francis P Cobbe') to Lady Bowring, inviting her and her friends ('Huxleys, Lyells & others') to meet Julia Ward Howe and husband. Without place or date [ before 1872 ]. 2pp., 12mo. On lightly-aged paper with a number of vertical fold lines. The reference to Sir John Bowring dates the letter to before his death in 1872. With reference to Julia Ward Howe (author of the 'Battle Hymn of the Republic') and her husband Samuel Gridley Howe she writes: 'Dr. & Mrs. Howe of Boston whose names you are sure to know (philanthropist poetess) are coming to take a four oclock cup of tea with us on Thursday, the day after to morrow - We are asking a few your [sic] friends Huxleys, Lyells & others to meet them - & it would give us much pleasure if you & Sir John Bowring wd. [ Rhoda Power, children's author and BBC broadcaster, ] Two Autograph Cards Signed and Typed Letter Signed to B. I. Magraw, regarding scripts for children on BBC radio, and a piece on the capitulation of France. TLS on letterhead of the British Broadcasting Corporation, Bristol. 24 June 1940. ONE: ACS ('R Power'). 29 Devonshire Street, London. No date. In pencil (as Item Two). Addressed to 'Mrs B. I Magraw | Ash | Canterbury'. In fair condition (as Item Two), lightly aged and worn. Begins, on the subject of a proposed children's script for BBC radio: 'Will you go ahead with Akbar? I am in a nursing Home pro. Tem – small sudden operation – septic tonsils & will be incapacitated for a fortnight.' She reassures her about the script: 'I know you'll do a good job. [The Bath Gas Company Bill, 1837.] 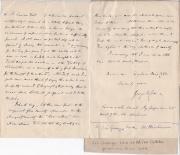 Autograph Letter Signed from George Olive to H. J. Mant of Bath, discussing the testimony to a Parliamentary committee of 'Witnesses produced by the Promoters'. With signed autograph receipt from C. H. Capper. Olive's letter: Without place [London] or date [docketted 7 July 1837]. Capper's receipt: Birmingham. 19 February 1838. Olive's Letter: 3pp., 4to. Bifolium. Addressed, with postmark, on reverse of second leaf to 'H. J. Mant Esq | 2 Wood St | Queen Square | Bath'. The letter is without place or date. Olive has written the letter on behalf of the Bath attorneys Mant & Bruce (he states at the conclusion that 'Mr Bruce requested me to write to save him the trouble'), who are acting for an interested party (Capper?). Typed Letter Signed ('H D'Arcy Power') from the Southampton physician Dr H. D'Arcy Power, written in the spelling of the Phonetic League to 'Bryn', discussing the health of his wife Gretel, and with an autograph postscript by her. On his letterhead ('Consultations by Appointment Only'), 23 Brighton Road, Southampton. 11 April 1934. 1p., 4to. Fair, on aged, worn and creased paper. Seventeen lines in phonetic spelling, with printed key at foot, headed: 'NOTE - Members of the Phonetic League are pledged to use this Alphabet and spelling in correspondence.' Disregarding the use of the diaersis, the letter begins: 'Mi der Bryn, | Zis is only a not ov enqwiri tu asertan wezer yu ar stil aliv. Printed pamphlet for the '30th. Executive Meeting' of the 'International Commission on Large Dams U.A.R. Committee', containing tables, plans, photographs and a paper relating to the 'Aswan Dam Hydro-Electric Scheme'. 48pp., landscape 8vo, comprising [ii] + 28pp. of text, followed by 12pp. of tables and plans, and 6 photographs, two of them fold-outs. Stapled, in original card wraps. In fair condition, on aged high-acidity paper. The first page carries a photograph of a smiling Nasser, with the quotations 'Industrialisation is a target leading us to establish a socialist co-operative Community' and 'And Electricity is the backbone of Industry.' Apart from two pages listing 'Contracting firms participating in the scheme', the text comprises an essay by 'Dipl. Eng. 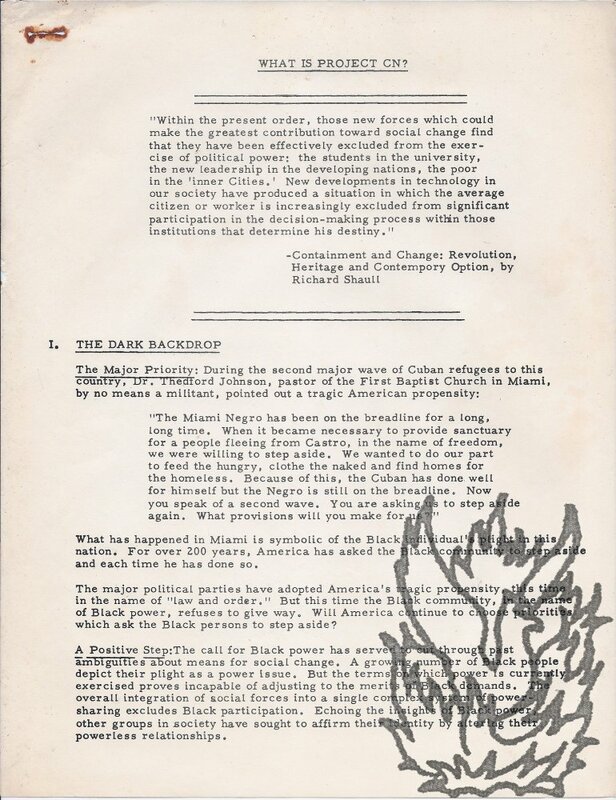 10 mimeographed pages, 4to (A4), small rust marks where staple used to be, (pages now detached), mainly good condition, discussing a newly founded organisation, with some church involvement, to stimulate Black participation in American society. Headings include: I. The Dark Backdrop; II. The Options; III. 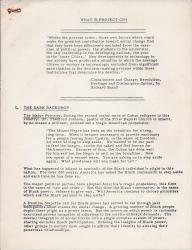 Project CN - Unique Approach (developing over thelast seventeen months!, including list of crisis points - Martin Luther's King's assassination, Tuskagee, support of workers groups, "Eastman Kodak encounter with FIGHT", etc); IV. 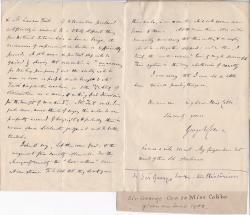 Autograph Letter Signed ('George W. Cox') from the historian Sir George William Cox to 'Miss Cobbe' [Frances Power Cobbe] praising her for her efforts in opposing vivisection. 6 July 1891; Scrayingham Rectory, York. 12mo, 3 pp. 44 lines. Text clear and complete. 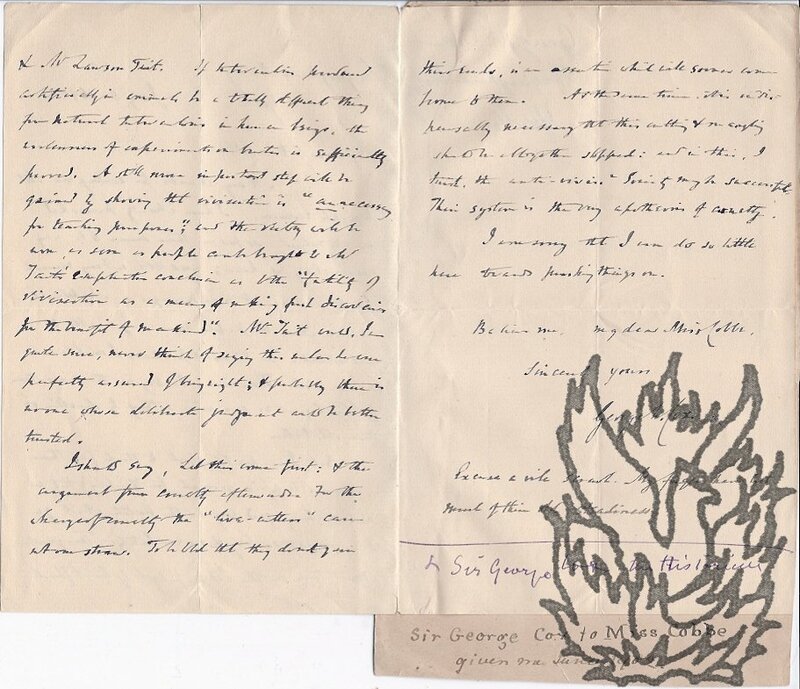 Fair, on aged paper, and with the reverse of the second leaf tipped in onto a leaf removed from an autograph album, with manuscript caption reading 'Sir George Cox to Miss Cobbe | given me June 1902.' The letter itself docketed at foot of third page in a contemporary hand. Cox's hand is crabbed and difficult. He thanks her for sending 'Mr Wright's sermon', but can make little use of it: 'The historical portions I must leave on one side. 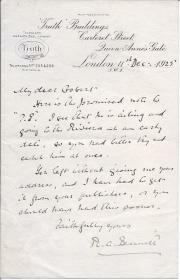 Autograph Letter Signed from 'R. A. Bennet', editor of 'Truth', to 'Osbert' [Burdett], regarding the Irish journalist and politician T. P. O'Connor. 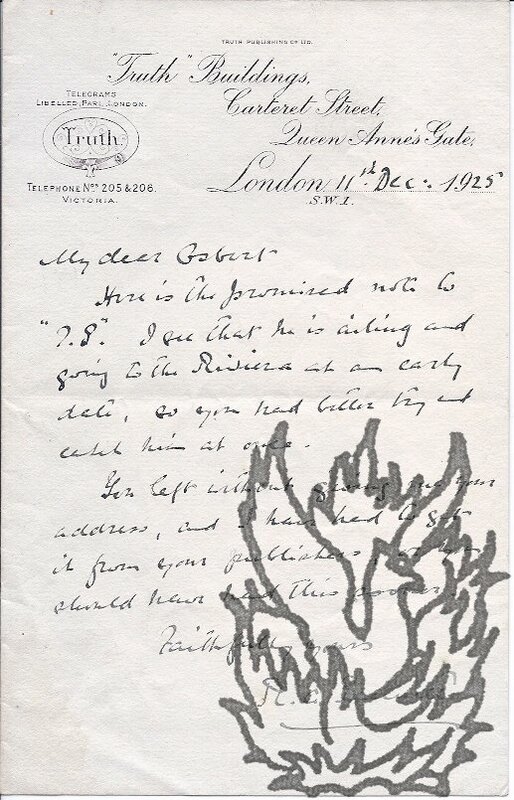 11 December 1925; on letterhead of 'Truth' Buildings, Carteret Street, Queen Anne's Gate, London. 12mo, 1 p. Nine lines. Text clear and complete. Good, on lightly-aged paper. Docketed in pencil on reverse 'R. A. Bennett re T. P. O'Connor'. He is enclosing 'the promised note to "T. P". I see that he is ailing and going to the Riviera at an early date, so you had better try and catch him at once.' Bennett had to get the recipient's address from his publishers, as O'Connor left without passing it on. Autograph Letter Signed ('W. Morrant Baker') to Power, on the publication of his 'Craft of Surgery'. 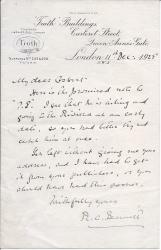 16 June 1886; on his Wimpole Street letterhead. Typed Letter Signed ('Anthony') from Blond to Ali, countersigned 'Tariq Ali'; Typed Letter Signed ('Tariq') from Ali to Blond; printed contract, with manuscript insertions, signed 'Tariq Ali', for a book by Ali to be entitled 'Ho Chi Minh'. All three items good, on lightly aged paper. The first two items were formerly attached to one another by a pin. ITEM ONE (one page, folio): Blond to Ali, 6 December 1967, on letterhead of Anthony Blond Ltd, Publishers. Characteristically punchy letter of clarification, headed 'WHO Really Is WHO', and beginning 'This is just to clarify the situation between us'. A list of eight points, the first of which reads 'You are wholly employed compiling this book at a salary of £1,500 per annum for one year. (Pamphlet - Offprint. A Paper read before the North of England Institute of Mining and mechanical Engineers. General Meeting at Newcastle-upon-Tyne, December 8th, 1894 (Excerpt from the Transactions of the Federated Institution of Mining Engineers, London and Newcastle, 1895). 26pp., tall 8vo, 2 plates, one folding, paper wraps, sunned, stained, and chipped, fold mark, wear and tear, contents good, pencil lines by some passages, a few pencilled noets on cover. Owneship signature of Henry J. Young, INSCRIBED "With the Author's Compliments".